As we all know, the balance of life, family, and work is tricky. However, no matter how hard my day gets, a grilled feast after a grueling day of work is not looked on as another hurdle towards bed, but rather the finish line of a long day. Oddly enough, my best grilled dinners are sometimes not on weekends, but rather weekdays. Sure, weekend dinners are planned better (sorta), but even when I plunge my bald head and arms into the freezer searching for some last minute beef, I know good times are ahead. So, what’s my go-to school night/work night/weeknight grilled meal? 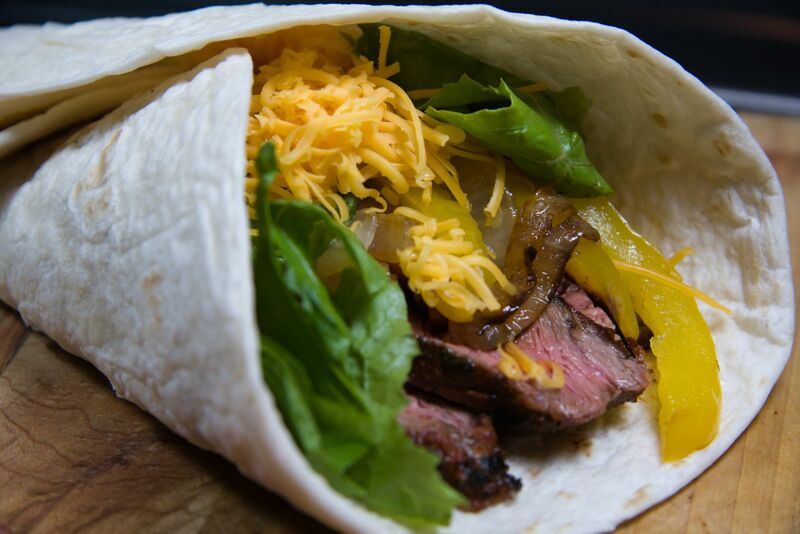 That’s easy, Flat Iron Fajitas. Flat iron steak is incredibly tender and flavorful, it is also inexpensive, and since my grocery store typically sells them in sells them vacuum sealed, the flat iron steak is great for storage. I always have a couple in the freezer, always at the ready. It’s a great piece of meat to have along, especially on a weeknight. Note: While ideally, I like to thaw my flat iron steaks in the refrigerator overnight, last minute thaws in the sink, under a steady stream of cold running water, can take just under an hour. Fajitas in our house are made with grilled onions and peppers, topped with shredded lettuce and cheese, and slathered with a spoonful of salsa verde. Sometimes I even add in grilled corn. In the end, go with what you want. 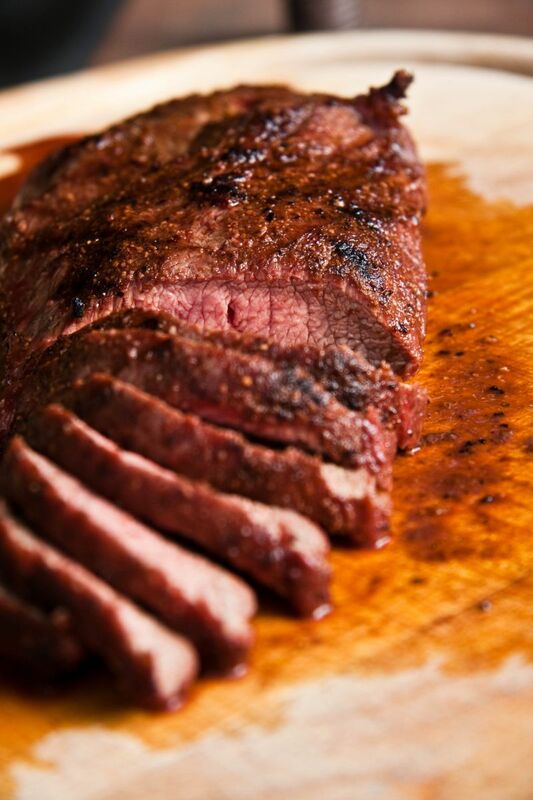 The most important thing is a quality flour or corn tortilla and a perfectly cooked flat iron steak. 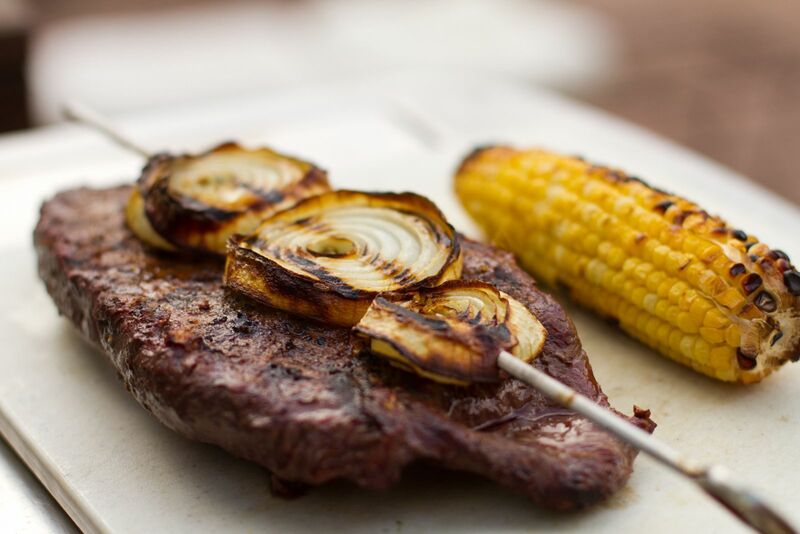 For the flat iron, prepare the grill for high heat. Lightly brush with olive oil. Season the steak with cumin, kosher salt, freshly cracked pepper, and a dash of cayenne pepper. Grill the steak over direct medium-high heat for 3 minutes, then rotate the steak 90 degrees. Grill another 3 minutes and flip. Grill another 3 minutes, and then rotate the steak 90 degrees again. Grill another 3-5 minutes, or until the steak reaches an internal temperature of 130 F with an instant-read thermometer. Remove from the grill and allow to rest. Thinly slice the steak against the grain and place on the tortillas. Top with the sides of your choice and serve.